Posted: Mon Jul 23, 2012 6:19 pm Post subject: Re: Sears Marine Batteries are up to 60% off!!! Thread closed until you take it back and get the NASCAR one. Posted: Tue May 27, 2014 11:17 am Post subject: Re: Sears Marine Batteries are up to 60% off!!! On sale again for $234.89. I know they pricing on these changes weekly. Posted: Tue May 27, 2014 11:45 am Post subject: Re: Sears Marine Batteries are up to 60% off!!! How's that a sale? I paid $231 for mine. Posted: Tue May 27, 2014 11:53 am Post subject: Re: Sears Marine Batteries are up to 60% off!!! I paid $174 for my PM2 a week or two ago. Jimbolio, the PM1 is up to $289 regular price now! Posted: Tue May 27, 2014 12:52 pm Post subject: Re: Sears Marine Batteries are up to 60% off!!! Tough crowd! I have been watching these off and on for probably 6 months and they are usually around $289 now. Posted: Tue May 27, 2014 1:07 pm Post subject: Re: Sears Marine Batteries are up to 60% off!!! I think we need a price alert whenever a non-member detects a sub $200 price. Posted: Tue May 27, 2014 1:35 pm Post subject: Re: Sears Marine Batteries are up to 60% off!!! Agreed on price alerts for deals on batteries! my Stock 2012 battery is leaking all over the place and dealer won't replace it saying it hasn't FAILED. 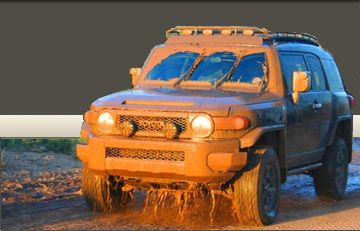 Ooops my Taco ended up in the FJ forum, but it\'s cool over here. Posted: Tue May 27, 2014 1:36 pm Post subject: Re: Sears Marine Batteries are up to 60% off!!! Details? Did that involve some combined discounts or some other special deal? Today's price includes 2 discounts and price will be higher tomorrow. Posted: Tue May 27, 2014 1:54 pm Post subject: Re: Sears Marine Batteries are up to 60% off!!! My price was a little off... 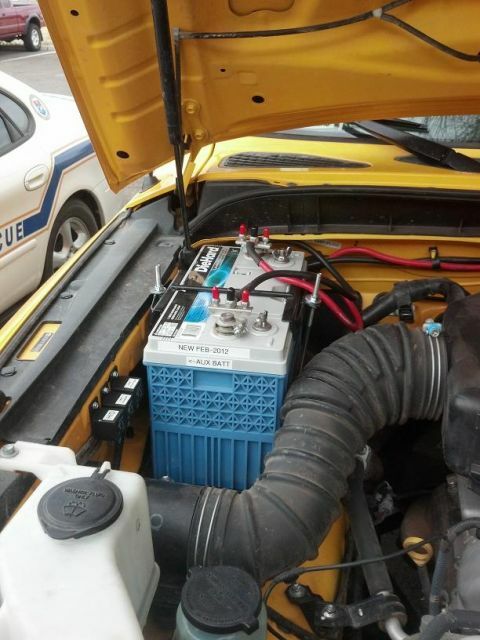 This is the smaller group 34 battery, not the giant one. Posted: Tue May 27, 2014 2:25 pm Post subject: Re: Sears Marine Batteries are up to 60% off!!! Yeah, my $231 was for the 34M size. My P1 31M was $200 used. But it was a 2012 batt. Posted: Tue May 27, 2014 7:21 pm Post subject: Re: Sears Marine Batteries are up to 60% off!!! 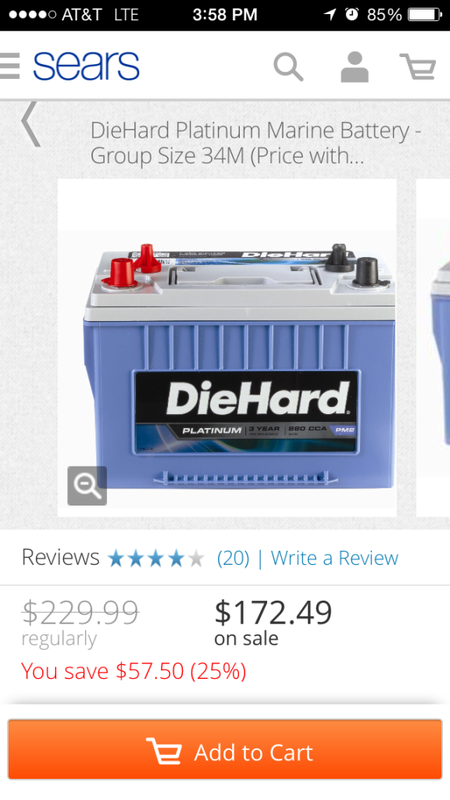 Posted: Tue May 27, 2014 7:30 pm Post subject: Re: Sears Marine Batteries are up to 60% off!!! So "fail" it. If I recall, yours is not sealed so this is easy, put some baking soda in 2 cells. Posted: Wed May 28, 2014 8:17 am Post subject: Re: Sears Marine Batteries are up to 60% off!!! Price back up to $260.00 this morning. Good thing I ordered it last night and pick up today! Posted: Wed May 28, 2014 10:44 am Post subject: Re: Sears Marine Batteries are up to 60% off!!! I also ordered last night for $214. Tried about 10 different coupons, even put 2 in the Cart and used the $300-400+ coupons but still couldn't get below $214 per battery. Great buy. Posted: Wed May 28, 2014 10:48 am Post subject: Re: Sears Marine Batteries are up to 60% off!!! It may be worth checking the in-store price as well. The last couple times I went in the PM2 was on the shelf for $206.